Summary: Hinduism derives its philosophy and essential beliefs and practices from many sources. In this essay we examine the influence of scriptures upon Hinduism, with specific reference to the Vedas, why they are considered inviolable and an important source of verbal testimony, and the importance of the Upanishads. Unlike other major religions, Hinduism does not rely upon a particular scripture or a revelation of God to present its present is philosophy, beliefs or metaphysical truths. Since it draws its inspiration from numerous sources, from teacher traditions, ascetic movements to literary sources, it has very complex, comprehensive and multilevel approach to its essential creed. In this article we will examine the main scriptures or the principal texts which contributed to the origin and development of the great tradition called Hinduism. We will also briefly touch the mantra tradition which is an integral part of the Vedic tradition and derived from the same texts. Over a period of several centuries during which it underwent a great transformation, Hinduism drew its inspiration from various sources. 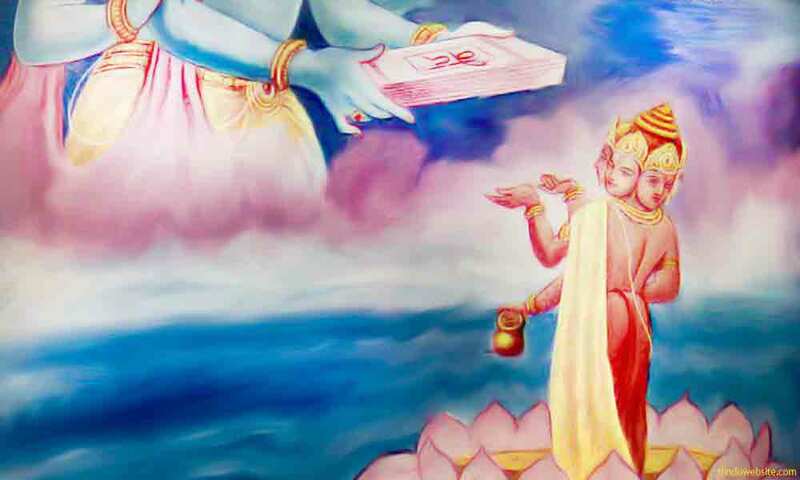 Of them, the important sources are the Vedas, the Upanishads (which are actually the end portions of the Vedas), the Vedangas, the Puranas, the Bhagavad gita, the Darshanas, the Sutras, the two major epics called the Mahabharata and the Ramayana, the Agamas, the Vaishnava literature, the law books called the Dharma shastras, commentaries called Karikas and Bhashyas and so on. The works of great personalities like Shri Shankaracharya, Shri Ramanuja, Nimbarka, Vallabhacharya etc., also contributed to the revival of the religion and its popularity at a time when it was passing through great difficulties. The Chandogya Upanishad (7.7.1) distinguishes learned knowledge (vijnanam) from the knowledge of the Self. It declares that learned knowledge is better than meditation (dhyana) and explains what it means in the following words, which gives a brief overview of the extent of knowledge which was known and taught to students in ancient India. “By learned knowledge only one understands the Rigveda, the Yajurveda, the Samaveda the Atharvaveda as the fourth, the epics and the Puranas as the fifth, the Veda of the Vedas (grammar), the knowledge of making sacrificial offerings to ancestors, the knowledge of numbers and drawing birth carts, the science of predicting divine actions, the knowledge of treasures, logic, ethics, knowledge of gods, knowledge of Brahman, knowledge of spirits, knowledge of weapons, astronomy, knowledge of serpents and poisons, knowledge of celestial beings, heaven, earth, air, ether, water, fire, gods, men, cattle, birds, herbs, trees, all beasts down to worms, flies, and ants; the right and the wrong; the true and the untrue, the good and the bad, the pleasant and the unpleasant. All this is known by learned knowledge only. Meditate upon learned knowledge." The Vedas are four in number namely the Rigveda, the Yajurveda, the Samaveda and the Atharvaveda. According to one tradition, only the first three were accorded the status of the true Vedas for a long time, while for reasons not known to us, it took some time for the fourth one to join the rank of the rest. The Vedas are called Nigamas, in contrast to agamas of Shaivism. They are believed to be composed neither by man nor by gods but were revealed to Vedic seers in meditative states. Hence, they are called "shrutis" (the heard ones), in contrast to "smritis" (the memorial texts). The Vedic Aryans regarded the Vedas as timeless (sanatana), revealed by Brahman, the Supreme Being, through Brahma, the creator god, for the welfare of the world. They are considered eternal and indestructible aspects of Brahman which will remain with us for the duration of the creation cycle and will be withdrawn like everything else at the time of the dissolution of the worlds and beings. They form the basis of Vedic religion out of which Hinduism of today evolved through gradual phases. The Vedas are considered the personification of Brahman in literary form. Hence, they are inviolable, holy, and worthy of veneration. The Vedas are companions of the learned, the knowledgeable and the wise. They serve the humanity in upholding Dharma and helping them achieve liberation. When recited, they purify the mind and body and increase the quality of Sattva. Having the knowledge of the Vedas makes a person noble and austere. Studying them is a good karma. When they are loudly chanted, the sounds also purify the atmosphere and make the place holy. The symbolism of the Vedas is represented in Shri Dattatreya, who is considered a manifestation of Lord Vishnu. He is shown to be always followed by four dogs who remain at his feet all the time. These four dogs represent the four Vedas, signifying that the Vedas would always remain in the service of God, like faithful dogs and serve his cause. The Vedas were not human compositions. It is said that they were revealed to several seers (rishis) in very ancient times. We cannot fathom their antiquity. The Puranas suggest that they were transmitted by Brahma to his first progeny at the very beginning of creation. According to tradition, the seers who were instrumental in their transmission came from the family of the Angirasas (the nourishers of the divinities with milk, fluids, and oblations). The Rigvedic hymns were ascribed chiefly to seven seers namely Atri, Kanwa, Vashistha, Viswammitra, Jamadagni, Gotama, and Bharadwaja. Their names still carry a lot of importance in the family lineages (gotras) of several high caste Hindus and as family names. The word "Veda" is derived from the root word "vid" which means to know. (Vid is also the root word through Latin for the English world video). The Vedas are thus books of knowledge as seen by the seers in their mind’s eye. Devout Hindus revere and regard them as very sacred and as the ultimate source of all their religious knowledge. It is said that all the knowledge of the world is hidden in the Vedas beneath layers of symbolism and can be intuitively deciphered by cultivating pure (sattvic) discernment (buddhi). Even today there are many Hindu scholars who try to trace many of the modernday scientific inventions and discoveries to the knowledge which is hidden in the Vedas. Since the Vedas were the heard ones, they were also orally transmitted by teachers to students to maintain and protect their purity and sanctity. For over two millenniums there were passed on from generation to generation through oral transmission. Since they were believed to be the embodiment of Brahman, the Vedic scholars and teachers placed heavy emphasis upon their pronunciation, grammatical nuances, and correct chanting of the hymns to avoid mistakes and maintain their efficacy during the performance of the rituals. The Vedas are voluminous works. They are divided into the following four divisions. The Samhitas, which contain the collection of the original hymns in praise of various gods and goddesses. The Aranyakas or the books of the forest, which contain information on the nature and importance of sacrifices and their relation to man and the universe. The Upanishads which form the end portions of the Vedas and constitute the Hindu Philosophy known as Vedanta. Rigveda is "the oldest scripture in the world"
Among the four Vedas, the Rigveda (Knowledge of the Verses) is the oldest and the most important. It contains 1017 (according to some 1072 or even 1028) hymns or suktas, divided into ten mandalas or books. The hymns are mainly invocations to various gods and goddesses, extolling their virtues, divine qualities, achievements, conquests, preferences, potencies and associations. The gods and goddess of the Rigveda are immortal, all knowing, who will bestow boons and favors upon human beings and bless them with their help and support in day to day life, if they were invoked properly through certain rituals and symbolic sacrifices. The principal deities who are extolled in the Rigveda are Indra, Agni (fire), Vayu (wind), Soma (the moon), Surya (the Sun) who is also referred as Savitr and Vivasat, Dyau (sky), Aditi who is the mother of gods, Maruts (storm winds), Prithvi (earth), Vayu (wind), Apa (water), Ushas (dawn), Varuna (rain god and enforcer of dharma), Mitra, Adityas (7-12 solar deities), Vishnu, Pushan, Asvins who are twins, Rudra and Parjanya. In addition to these gods and goddesses, we also find invocations or references to Rbhus, or elves, Apsaras or nymphs, gandharvas or musical spirits, and even Asuras or the demons. In the Rigveda, Indra is the foremost of all gods, with the highest number of hymns addressed to him, followed by Agni. In the Rigvedic world, he enjoyed the same status as Vishnu or Shiva in today’s world. Besides being extolled as a great warrior, in some Upanishads we also find references to him as the knower of Brahman, student of Brahma, and teacher. The Indra of Rigveda is the god of light and delight, unlike the weak and vacillating Indra of the Puranas who has been the subject of numerous scandals and controversies. The Rigvedic hymns extoll him as the lord of the heavens, who slew the snake demon Vrata to separate the earth from heaven and release the waters. He is also deeply spiritual. He was the first among gods to know and see Brahman. According to the Kena Upanishad, he went nearest to him and learned about Him from Uma Haimavathi. He also took initiation from Brahma and spent thousands of years to know the essential nature of Self and Brahman. Although the Rigveda forms the core of present day Hinduism, Indra does not enjoy the same status or veneration in Hindu temple rituals or domestic worship. However, he is still extolled and invoked with offerings and oblations in the Vedic sacrificial ceremonies. It is noteworthy that Vishnu and Shiva who were later elevated to the status of the Trinity along with Brahma, are minor deities in the Rigvedic pantheon and do not receive as much attention. The Rigveda also contains hymns extolling the virtues of Soma juice, how it should ritually be extracted by pressing the leaves of a mysterious plant and offered to the deities. At the end of the Soma sacrifice, after making due offerings, the worshippers probably consumed it due to its intoxicating nature and experienced visions in a state of trance. One of the most important hymns of the Rigveda is the creation hymn which speculates upon the conditions before creation and the difficulties in ascertaining when and how the worlds manifested out of chaos, and whether the creator himself, That One (Tad ekam), has any knowledge of it. The tenth mandala contains Purusha Sukta (10.90), a hymn which describes how gods, Vedas, birds, wild and domestic animals, humans and the four Hindu castes came into existence from the thousand headed Cosmic Being (Purusha), following a self-sacrifice. The other three Vedas, Yajurveda, Samaveda, and Atharvaveda contain many verses from the Rigveda apart from their own. Originally, there were three Vedas only, which were known as Triveda. Subsequently, Atharvaveda was added to the collection. The Yajurveda contains the knowledge of Yajus or sacrificial formulae. Its emphasis is more on the mechanics of performing the rituals for the invocation of gods such as the implements to be used and the offerings to be made by the priests while performing them. The Yajurveda is divided into two parts, the White Yajurveda and the Black Yajurveda. The Samaveda is more lyrical in nature and contains the knowledge of the Samans or chants. They are sung loudly at the time of sacrifices. Due to their melodious nature and metrical composition, in the Bhagavadgita Lord Krishna declares that among the Vedas he is the Samaveda. The Atharvaveda contains 20 books. The hymns are mostly meant to cast magical spells or charms, for protection from enemies, death and destruction or for long life, good health, sexual favors from lovers or spouses, name, fame, peace and prosperity. It also includes several hymns of the Rigveda. In the Atharvaveda we see a striking union of Vedic ritualism with primitive, animistic beliefs and practices, which forebodes the emergence of Tantra and left-hand methods of ritual worship in the post Vedic period. Atharvaveda not only deals with gods and goddesses but also with "dark and demonical powers" who need to be supplicated and won over or manipulated with ritual power and with the help of gods. For the modern minds, the methods of the Atharvaveda may sound distasteful and archaic. However, from a historical perspective, it should be viewed as a defensive mechanism or a type of magical warfare developed by the Vedic priesthood to assert their power and dominance against rival traditions, and protect themselves and their patrons from any harm from their enemies. The Upanishads are the end parts of the Vedas. Hence, they are also known as Vedanta. Each of four Vedas has a set of Upanishads associated with it. Their exact number is unclear. They were also composed at different times. Some Upanishads were composed just a few hundred years ago. Of the available ones, about 12 are considered major Upanishads. Of them also, Chandogya and Brihadaranyaka Upanishads are considered the oldest and the largest, which account for nearly 80% of the Upanishadic knowledge. All the major Upanishads of today are believed to be loose compilations from the older Upanishads, which seems to have been lost. While the Samhitas represent the ritual knowledge (karma kanda), the Upanishads represent the spiritual knowledge (jnana kanda) or the knowledge of Brahman, the Supreme Self, and Atman, the individual Self. While the Vedic sacrificial ceremonies are meant for the triple aims of dharma, artha and kama, the Upanishads are meant for the highest aim of mokha (liberation). They clearly affirm that ritual knowledge is inferior knowledge or false knowledge (avidya), while the knowledge of the Self or Brahman is the higher knowledge or true knowledge (vidya). They exhort people to renounce worldly desires, restrain the mind and senses and practice yoga to achieve union with the Self and escape from the mortal world. The Upanishads are invaluable to understand the mystic and spiritual aspects of Hinduism. They describe the mysterious and transcendental nature of Brahman and the illusory nature of our perceptions and the objective world. At the same time, they create hope for the devotees to escape from suffering and the consequences of karma. The major Upanishads are Brihadaranyaka, Chandyoga, Isa, Aitareya, Taittiriya, Katha, Prashna, Kena, Mundaka, Mandukya, Svetavatara. A mantra is one or more syllables, words, phrases, chants or prayers which are endowed with either positive or negative power to manifest, create, maintain, conceal or superimpose, reveal or destroy reality. Each mantra represents one or more of the five powers of God namely creation, preservation, concealment, revelation or destruction. It augments the human power with the divine power of the deity which is hidden in the mantra as its presiding deity. The Vedas are essentially books of mantras. Each of the Vedic hymns contains one or more stanzas which can be considered mantras since they are endowed with the power of Brahman or of the deity to whom it is addressed. It is said that when the mantras are chanted properly with right pronunciation and incantation, the power which is hidden in the mantra becomes unleashed and serves the purpose for which it is intended. Among all the mantras, the syllable AUM is considered the most auspicious and the very personification of Brahman in sound form (sabda Brahma). Because it is equated to Brahman, it is customary in Hindu tradition to use it as a prefix to all other mantras to improve their potency and efficacy. Mantras have the purifying power to cleanse the environment or drive away evil. A mantra is a deity by itself. It would come to life the moment it is properly pronounced. The sound that we generate while chanting a mantra carries with in it the seed of the deity's energies. Such energies can be released and directed for a specific cause by chanting the mantras properly. It is also believed that if the mantras are not properly chanted, they may be ineffective or create harmful or unexpected consequences. Hence, to minimize such risks, worshippers and students of the Vedas are advised to pay strict attention to the words in the mantras and their proper recitation. On the surface, the Vedas appear to be mere invocations. To today’s people, most of them may not even make sense, since the hymns were composed thousands of years ago and the Sanskrit which was used in their composition is now archaic. For millenniums the priests chanted them without even knowing what they really meant. However, those who have studied the Vedas in depth and who are conversant with Hindu symbolism know that they are loaded with a lot of hidden meanings and symbolic significance. In modern times, Aurobindo was the first to recognize the hidden symbolism of the Vedas which he expounded in great length in his work, “The Secret of the Vedas."